Jeremy Clarkson will have to take a break from work for “quite some time” after contracting pneumonia, the TV presenter has said in a statement. The Grand Tour presenter was admitted to hospital on Friday after falling ill while on a family holiday in Majorca. 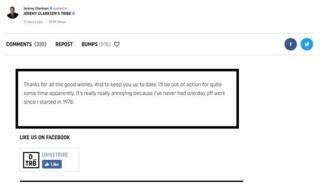 He said it was “really annoying” as he had never had a day off work. Clarkson also thanked fans for “all the good wishes”. On Sunday, it was confirmed the former Top Gear host was being treated in a hospital on the Spanish island. He had been due to return to filming his new Amazon Prime next week. However, in a statement posted on the social media site Drive Tribe on Sunday, he added: “Thanks for all the good wishes. And to keep you up to date, I’ll be out of action for quite some time apparently. Clarkson is the second Grand Tour host to be admitted to hospital this year. In June, Hammond, 47, was flown to hospital in Switzerland after crashing an electric super car in Switzerland. The car, which was being filmed for the latest series of The Grand Tour, burst into flames after Hammond escaped the wreckage. The presenter said he thought he was going to die during the incident, during which he became airborne and crashed after completing the Hemberg Hill Climb in Switzerland. 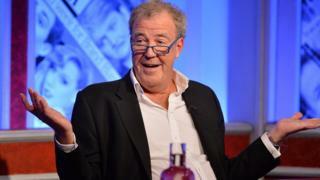 Clarkson was sacked from the BBC’s Top Gear in 2015 after punching producer Oisin Tymon, as well as calling him “lazy” and “Irish” in an expletive-laden exchange. Co-presenters Hammond and James May also left the show and followed Clarkson to Amazon Prime. Clarkson apologised to Mr Tymon for the “unprovoked physical and verbal attack”.